A full exploration of the state-of-the-art of social media research. Includes 33 chapters from emerging scholars and leaders in the field written exclusively for this volume, including Nick Couldry, Jose van Dijk, Siva Vaidhyanathan, Tarleton Gillespie, Zizi Papacharissi, Brooke Erin Duffy, Alfred Hermida, Jill Walker Rettberg, Jack Linchuan Qiu, Gerard Goggin and many, many others. 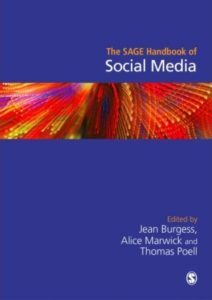 An excellent text for graduate social media study. Social media technologies such as YouTube, Twitter, and Facebook promised a new participatory online culture. 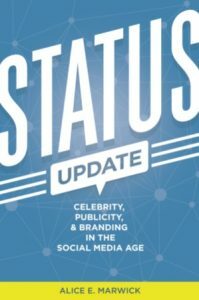 Yet, technology insider Alice Marwick contends in this insightful book, “Web 2.0” only encouraged a preoccupation with status and attention. Her original research– which includes conversations with entrepreneurs, Internet celebrities, and Silicon Valley journalists– explores the culture and ideology of San Francisco’s tech community in the period between the dot com boom and the App store, when the city was the world’s center of social media development. Marwick argues that early revolutionary goals have failed to materialize: while many continue to view social media as democratic, these technologies instead turn users into marketers and self-promoters, and leave technology companies poised to violate privacy and to prioritize profits over participation. Marwick analyzes status-building techniques– such as self-branding, micro-celebrity, and life-streaming– to show that Web 2.0 did not provide a cultural revolution, but only furthered inequality and reinforced traditional social stratification, demarcated by race, class, and gender.